Hello March! Hello Spring! 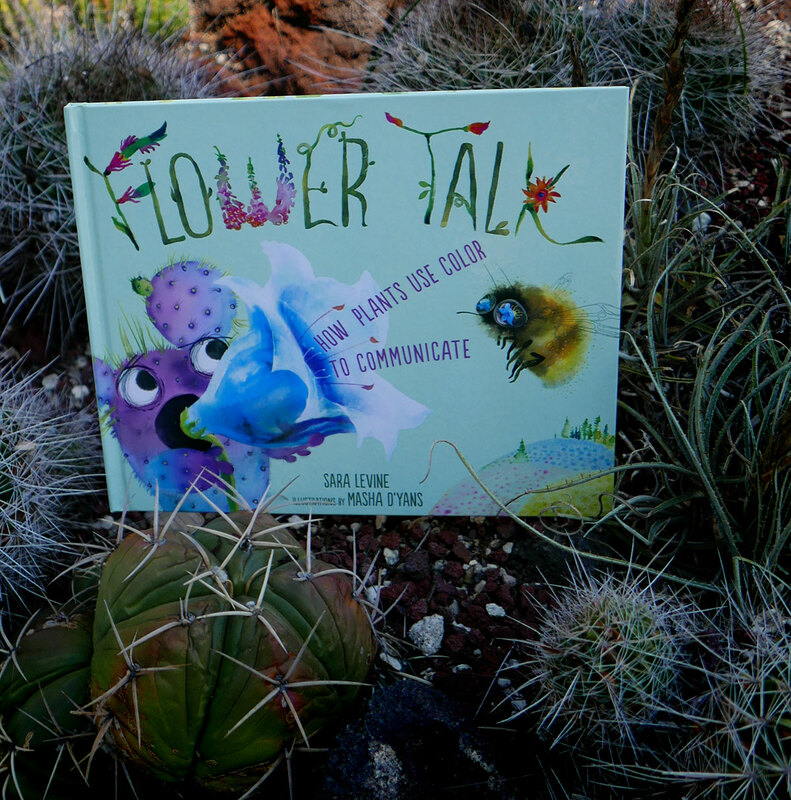 Hello Masha’s newest book Flower Talk: How Plants Use Color to Communicate! 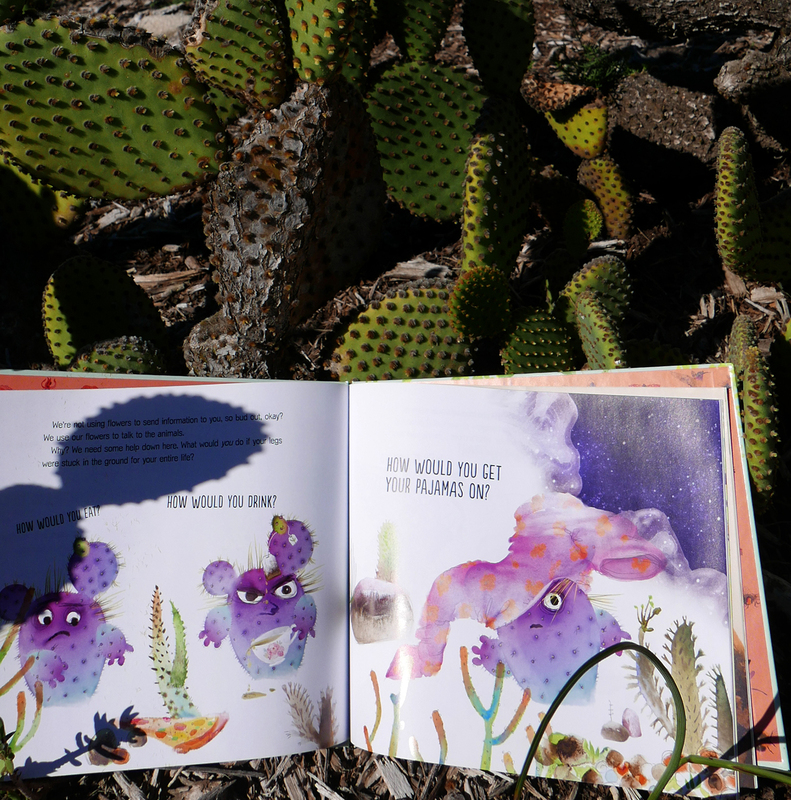 Follow our prickly narrator as he humorously explains what’s up with flowers and their pollinators. We certainly learned a lot just working on this beautiful project! We hope you do too while enjoying the lush art. He’s the guy who’s there when you need him — whether he’s helping you move into a nest of your own, walking you down the aisle (hello Wedding Season! ), or just spotting you that “occasional” $20. And if he’s anything like ours, he doesn’t want to talk about it. When it comes to celebrating Dad without embarrassing you both, mail is your best friend. Think about it: you get to show your appreciation without having to make eye contact — and you come out looking like the favorite child. One of these Dad-friendly cards is sure to perk up your old man and build up a stockpile of mutual understanding for the next time you lock your keys in your car and dial his number at 2 AM. 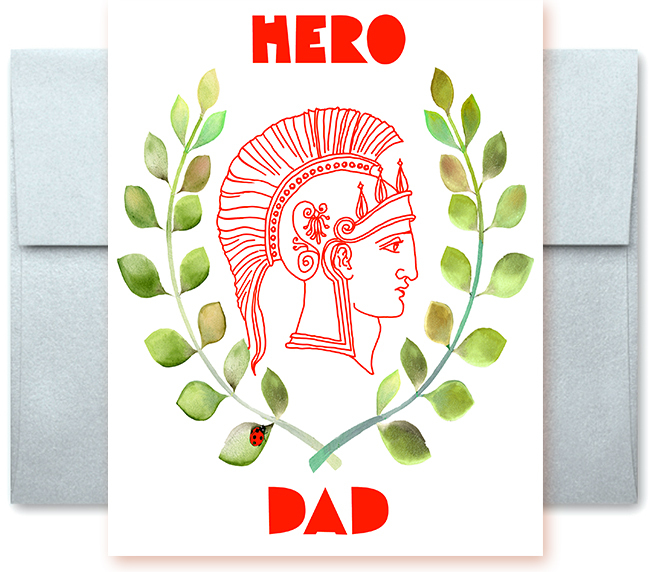 Now, he may not say it, but we’ll bet you five bucks your Dad would love to have a gift alongside that super-thoughtful card. But don’t worry, we’ve taken the time to round up some appropriately badass gifts to bring a reluctant smile to his eyes. 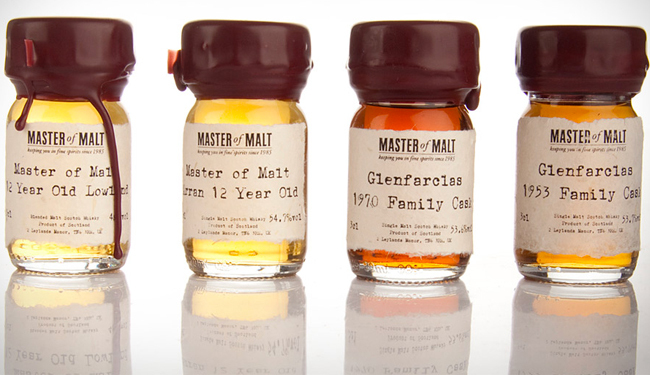 If your Dad’s got a taste for spirits, it doesn’t get much better than a box-full-o-whisky. Or gin. Or tequila. Or… all three? Browse Drinks by the Dram for the perfect way to butter dad up in preparation for your next birthday. 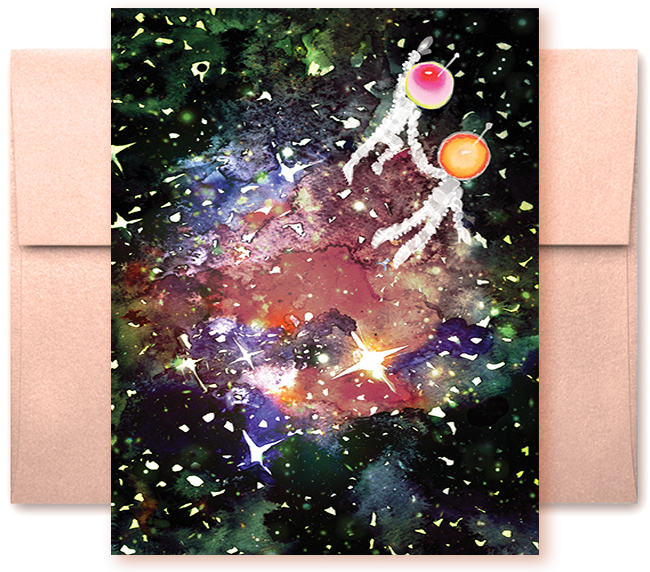 Dads and space go together like, well… dads and space, right? Tell him to focus on Jupiter instead of your recent poor financial decisions and you’ll both be winners! We don’t care how old you are, hammocks are the coolest. 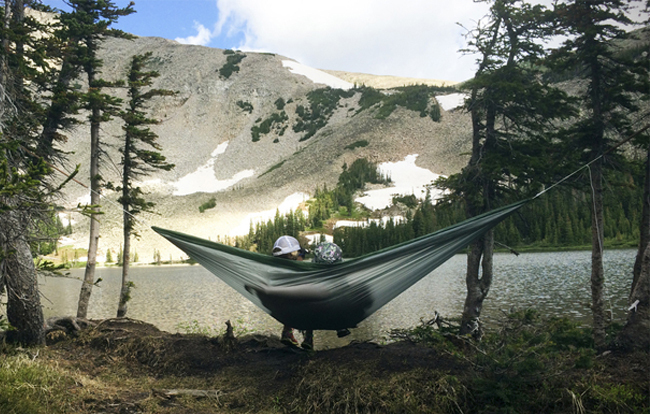 With this professional-grade hammock, Dad could sleep in a forest… on a mountain… even in a zoo if he was extra sneaky. Happy Father’s Day from Studio Masha D’Yans! 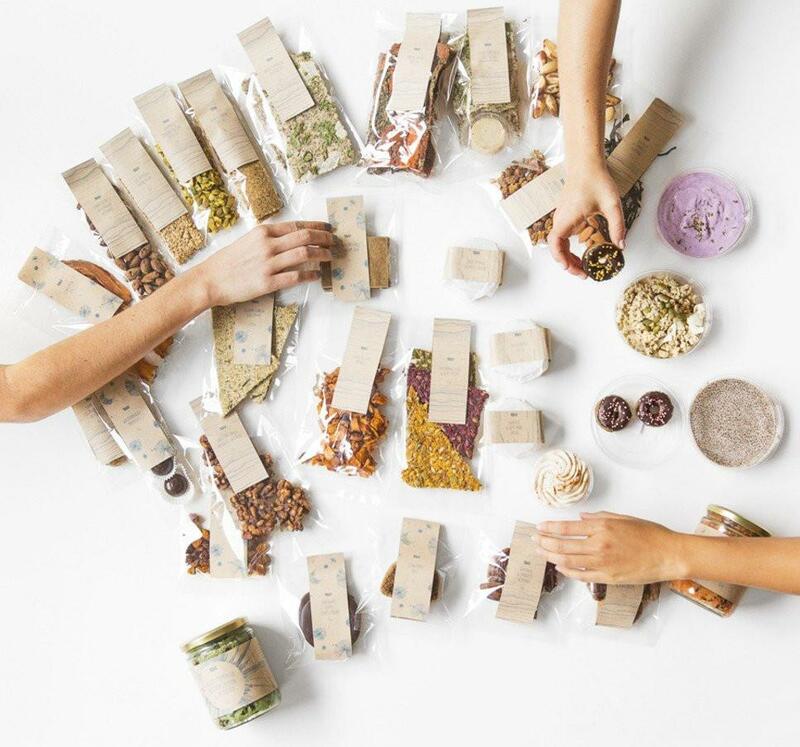 We’re the biggest fans of finding inspiration in the world around us — and that includes the world above us! Keeping up with celestial events like meteor showers and full moons is a fun way to stay in touch with our solar system’s breathtakingly whimsical wonders. In fact, coming up on April 29th is a Full Pink Moon, named after the creeping phlox: those perky little pink flowers that tend to crop up this time of year and officially usher in this fresh season. A pink-themed lunar event? That’s just the right shade of perfect for us! The color pink is a time-honored classic — whether it’s pale and delicate like the tiniest hint of coral in a vintage string of pearls, or in-your-face like a fuchsia fanny pack. We love it. Pink, while typically pigeonholed as a “girly” color, is actually a nuanced hue that communicates a rollercoaster of feels — calmness, tenderness, and optimism are just a few. Who doesn’t need more of those things in their life? And some even consider it the most rebel Punk color there’s is! 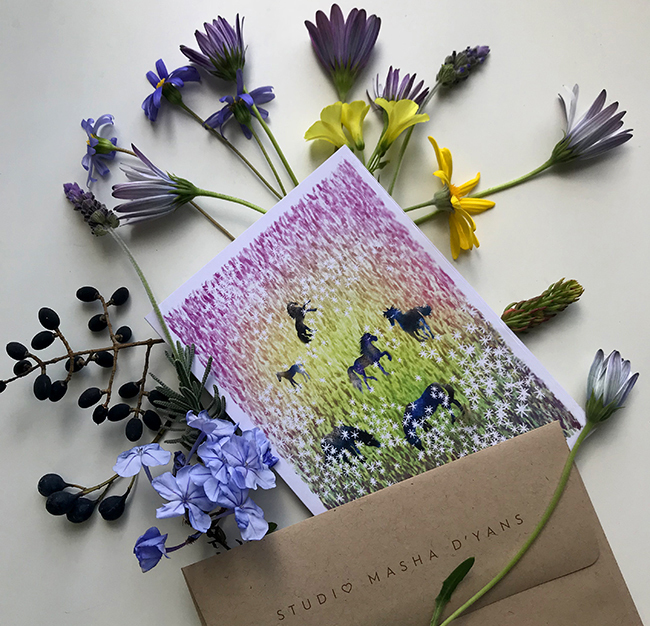 We’ve got bushels of watercolor cards here at Studio Masha D’yans that celebrate this unforgettable color, as well as some celestial selections if you’re eyes tend to stray to the skies! 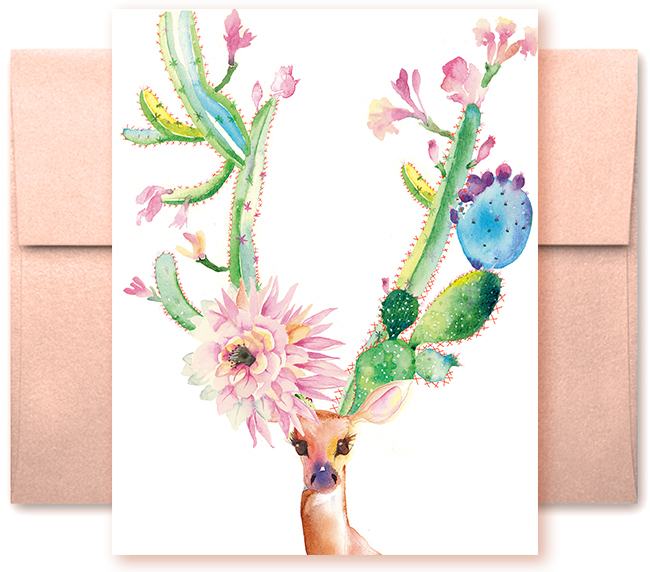 Earth tones and vibrant pinks mingle and mix in this mashup of flora and fauna! 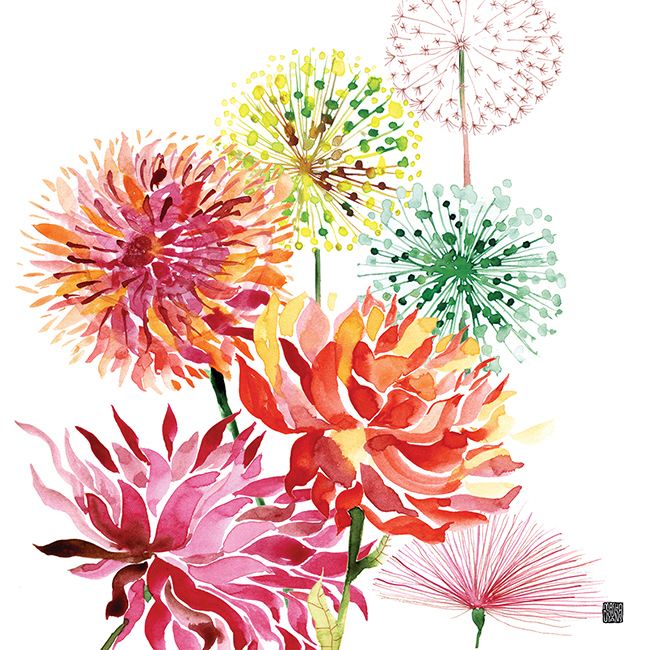 This fantastic color is front and center in this festive celebration of spring. Turn your eyes to the skies and let your imagination frolic among the stars! We hope you get to enjoy this rosy celestial event! Hey, it’s almost May Day! What gives you more warm fuzzies than a playful surprise showing up on your doorstep? 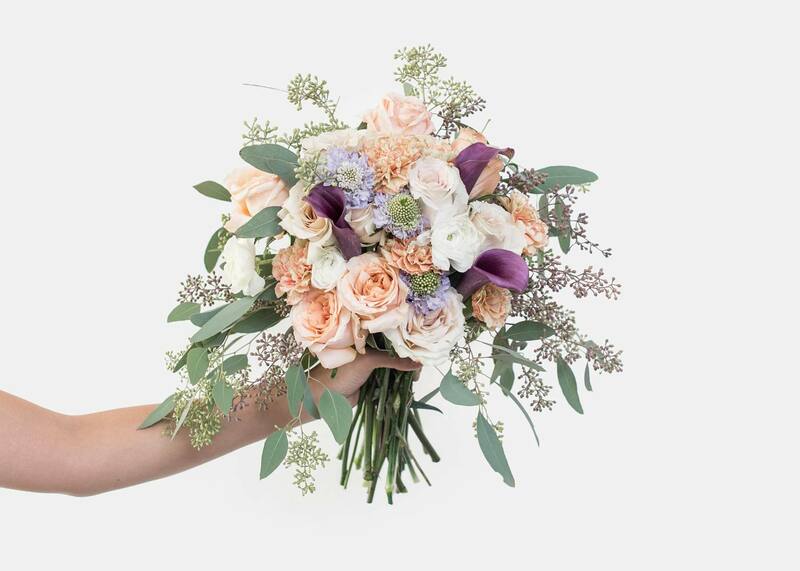 Whether it’s a basketful of jelly beans in your fave color, a bottle of bubbly from someone who knows you well or daffodils popping after April showers, we think May Day surprises are the bee’s knees. 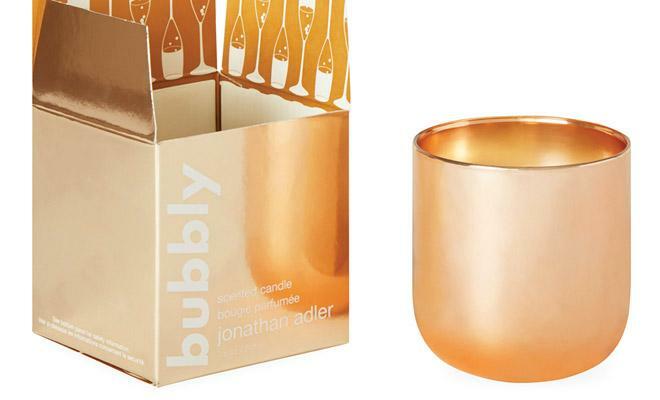 May Day is a fun, classic holiday… but did you know just how classic? We’re not talking classic like a string of pearls, we’re talking historical, ancient classic. Like, Stonehenge classic! 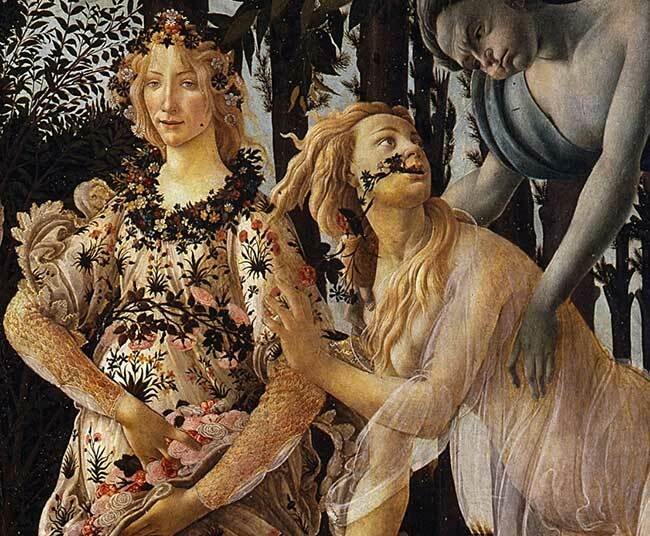 One of the oldest origins of May Day lies with the Druids of the British Isles, who believed May 1st symbolized the return of life and fertility to their part of the hemisphere. 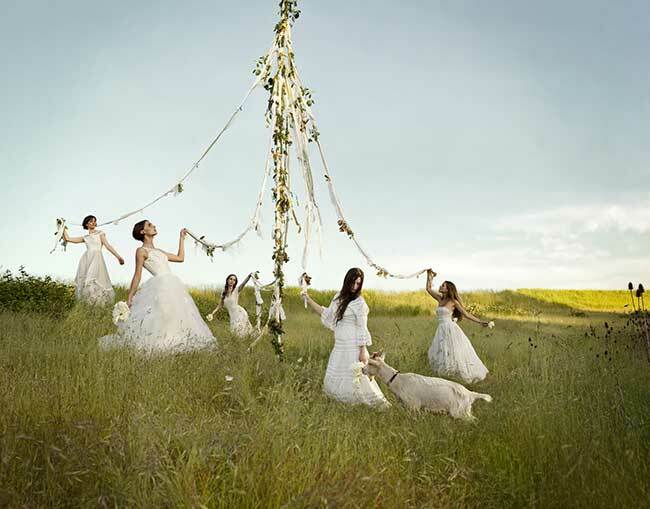 The Romans took this time to celebrate Flora, their goddess of flowers, and in Medieval times, the Maypole became a well-known tradition. 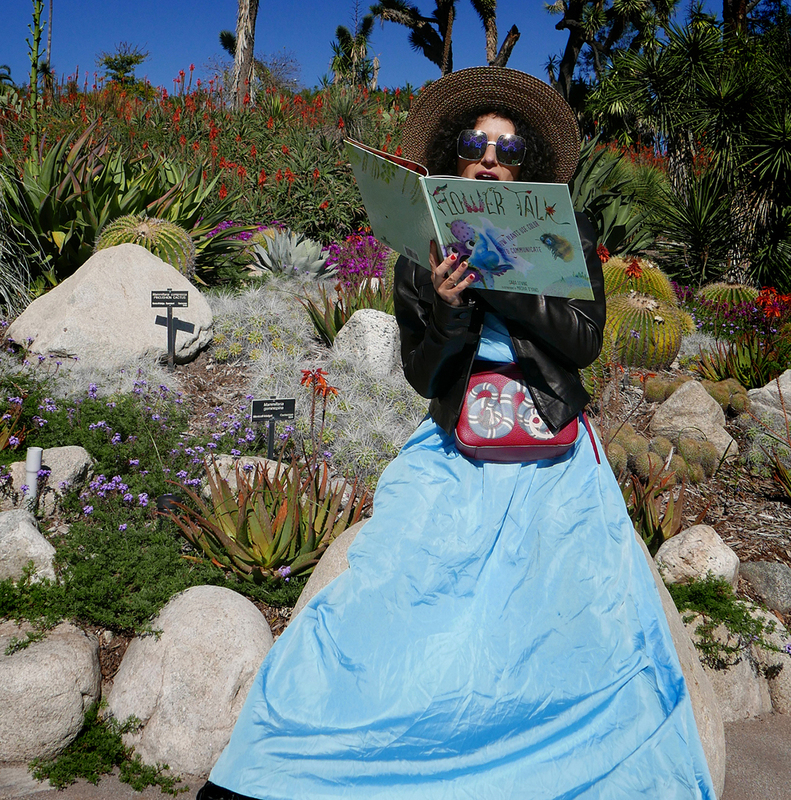 Frolicking, flowers, and light? 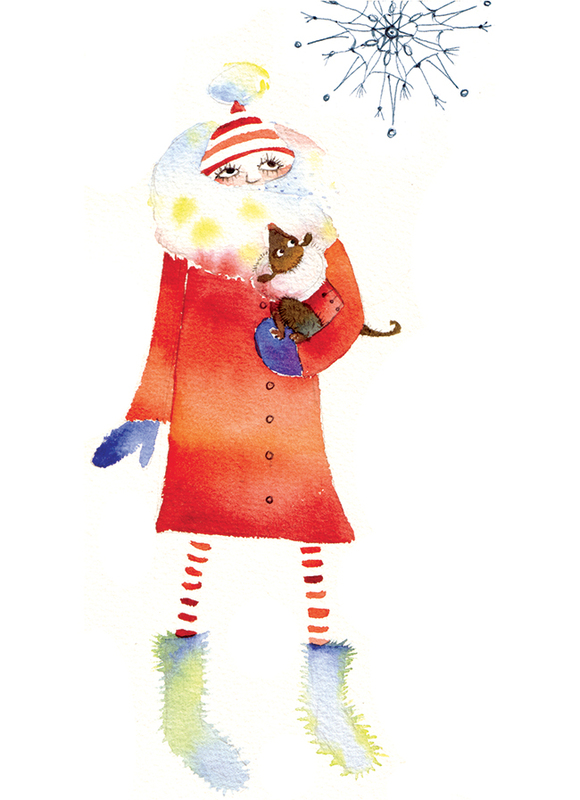 That’s our kind of holiday here at Studio Masha D’yans! Via Xtabay Vintage. Photographed by Holly Andres. 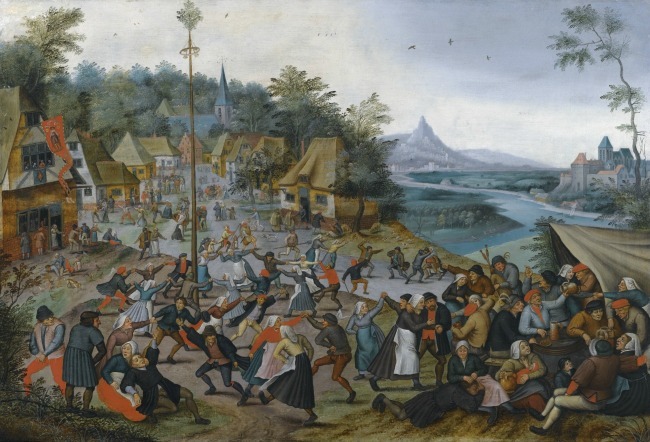 The cool history of this holiday doesn’t stop with the Maypole, however. In the US in 1886, May 1st was the beginning of the 8 hour work week, making great strides in the improvement of American working conditions. There’s just something about spring that makes you want to share some love, and that’s a trend that isn’t changing anytime soon. 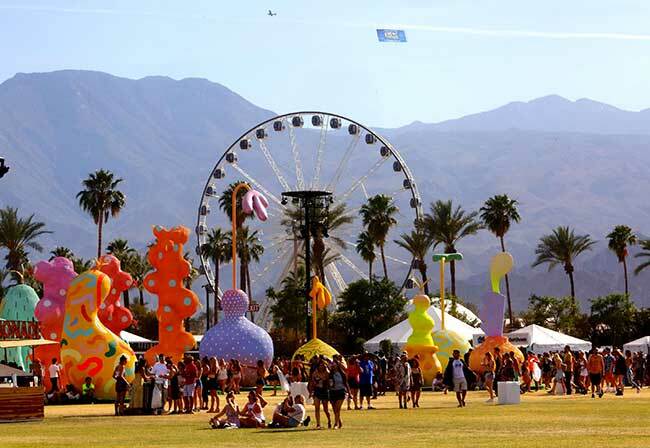 With massive springtime arts festivals like Coachella and Primavera Sound happening all over the world, it’s clear: it’s time to let loose! 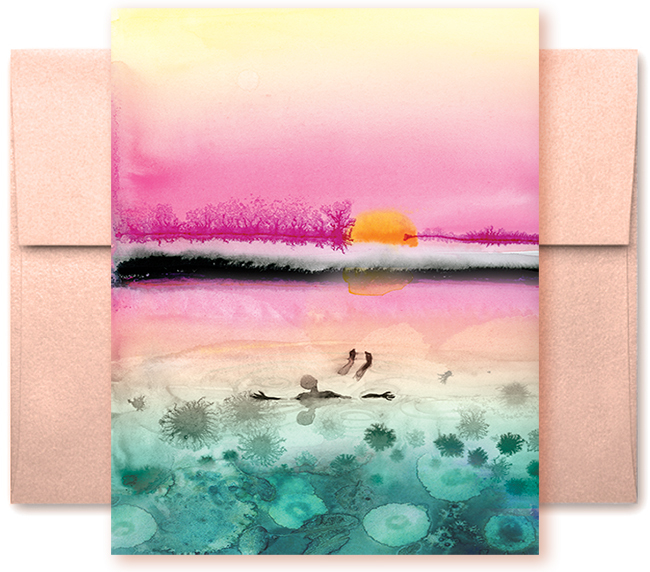 Get Excited for New Spring Greeting Cards! Look out your window! Now squint a bit… look closer… what do you see? Buds! Blossoms! Little green shoots! Life! 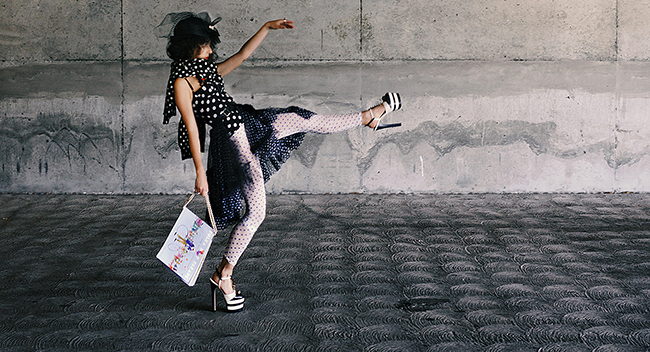 It’s time to get excited for Spring, don’t you think? 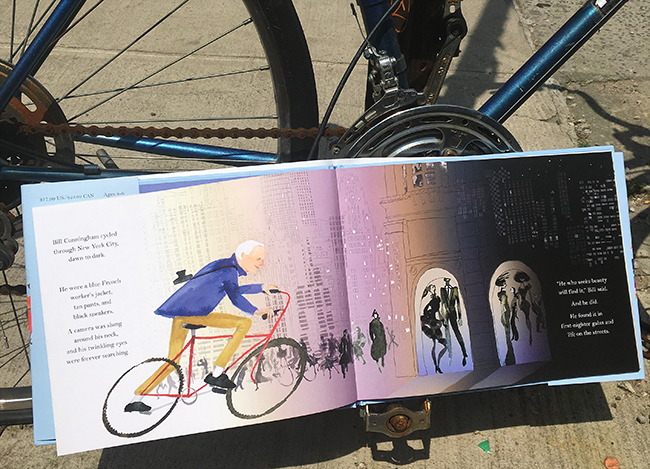 It’s a lush, vibrant time to open up the windows and let your tendrils stretch out and discover new friends, refresh connections with old ones, and breathe in some of that dewy, decadent sunshiny breeze. And you can’t forget about all of the holidays we get to celebrate — St. Patrick’s Day, Easter, Passover, and even April Fool’s Day deserve a little greeting card love! 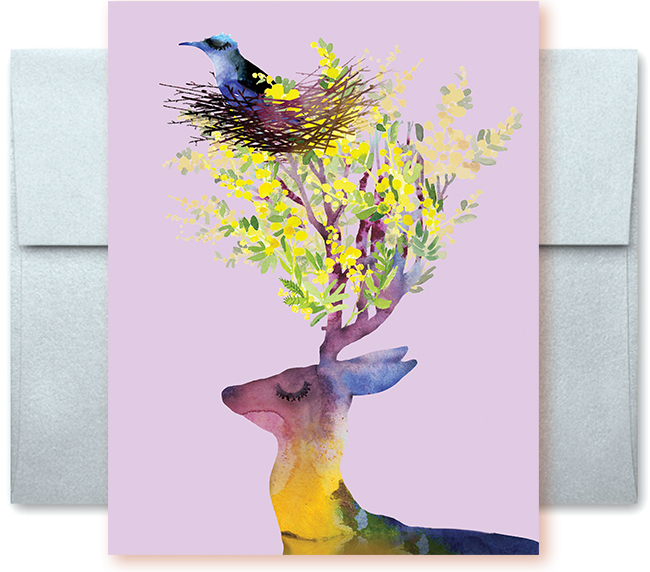 These vibrant spring greeting cards are just a small selection from our 35 brand new, freshly-added designs! 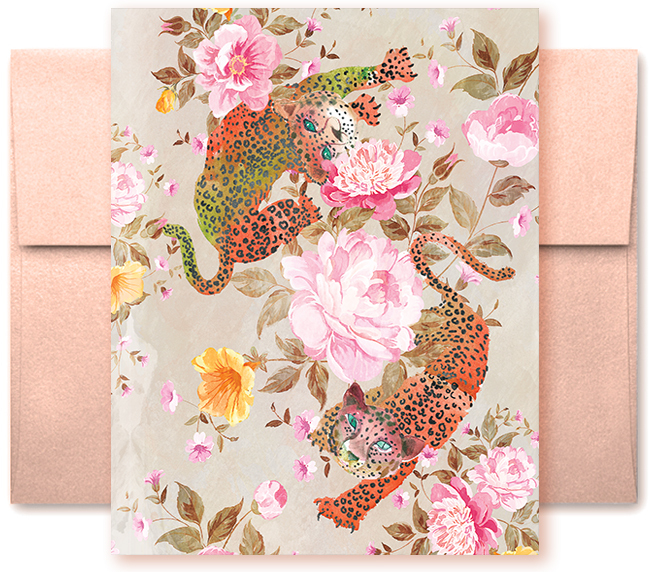 Each come with our gorgeous new envelopes stamped in elegant metallic ink. 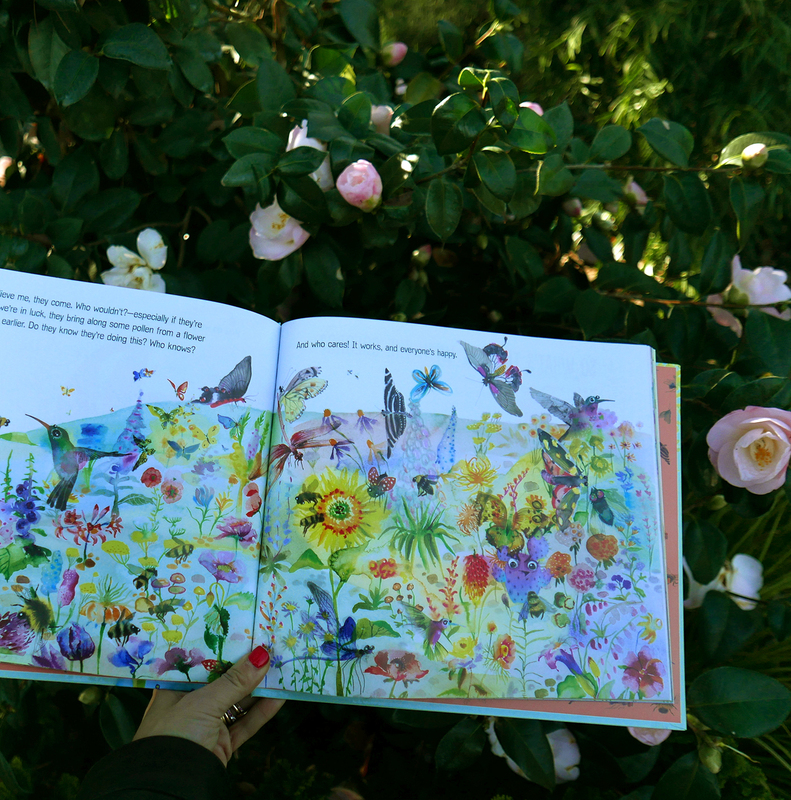 Browse through a few and send a little Spring in the mail! Gallop out of winter and dance into Spring! 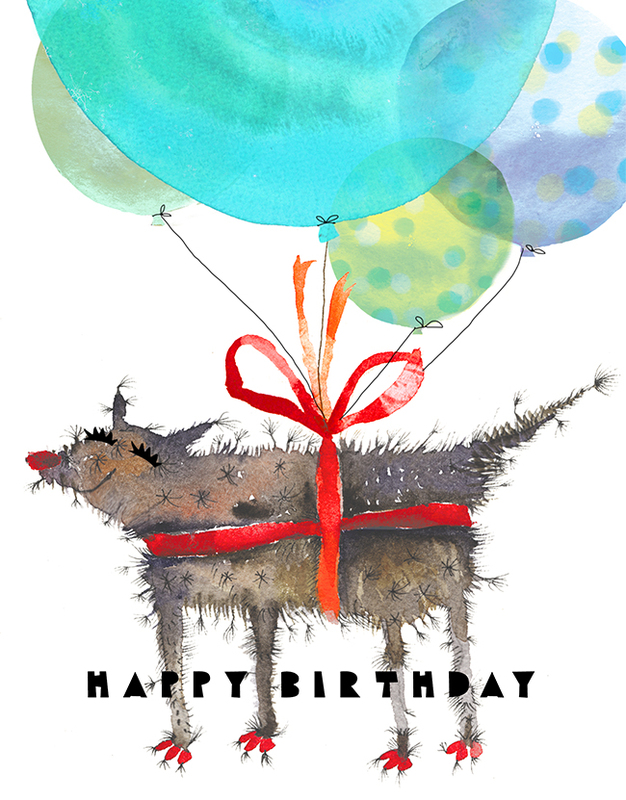 This joyful watercolor card is sure to add a lot of whimsy to anyone’s birthday. Nature is often a much-needed medicine, and the Stronger Tree is a good reminder of that. 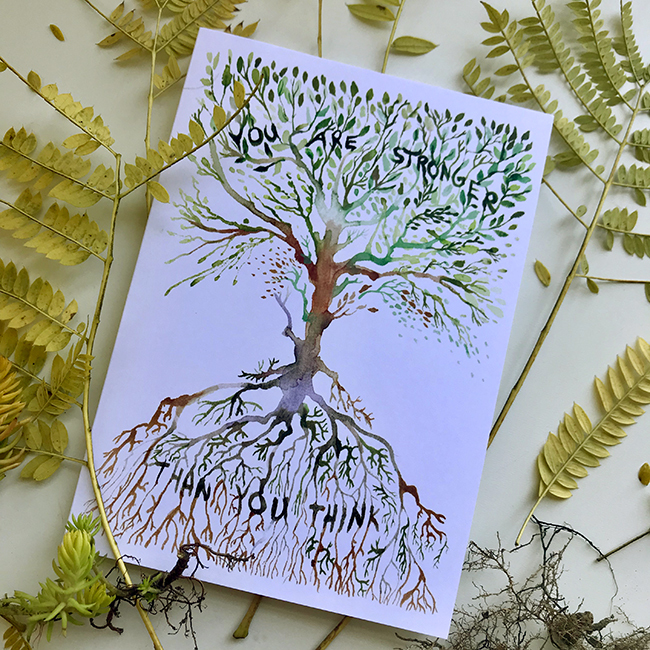 This lush, hopeful card is the perfect way to lift up someone who might need a bit of a boost. 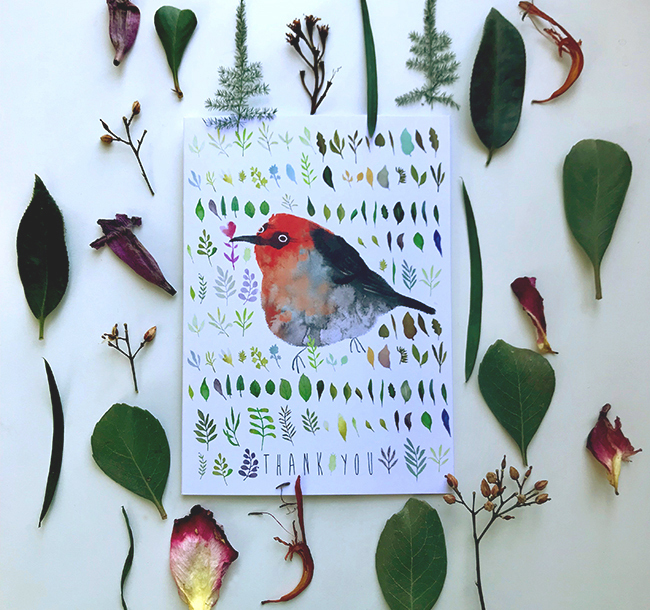 This little honeyeater bird is ready for the sweet flowers of Spring! Send him along to say “Thank You” to someone you love. 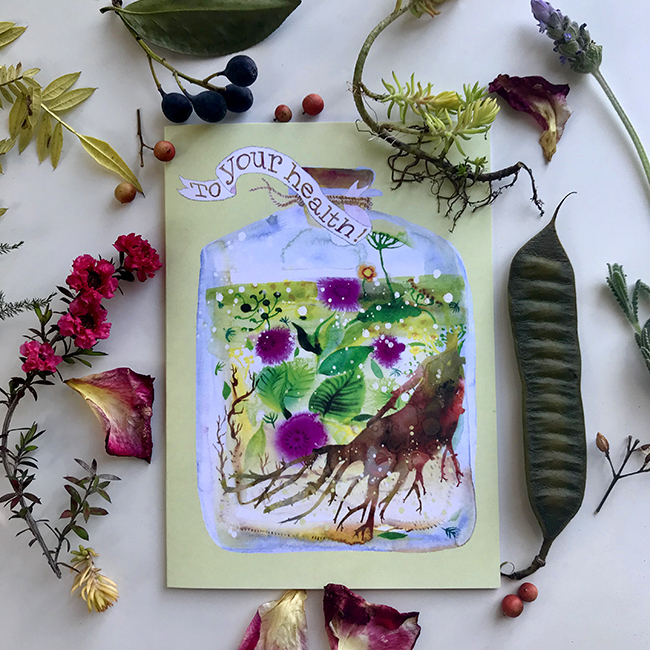 Sprigs and roots, bubbles and petals… this Health Potion card is a lovely reminder of both the healing powers of nature and the healing powers of correspondence. 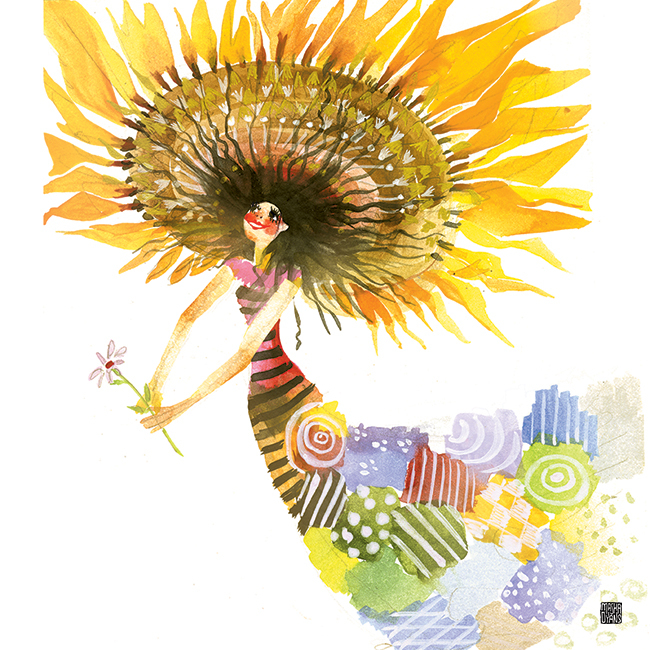 Spring’s all about new beginnings, blooms, and the sun poking through clouds – definitely things to frolic about! Let these happy horses prance into someone’s heart! 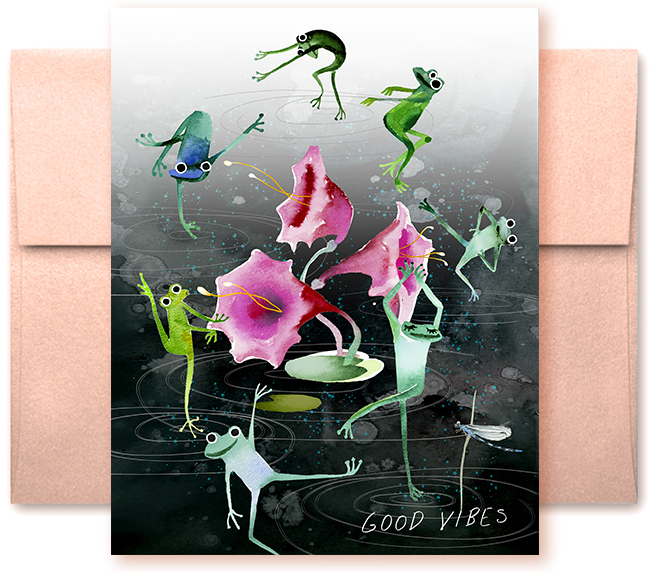 These five Spring greeting cards are only a few petals in a garden of whimsical watercolor fun. 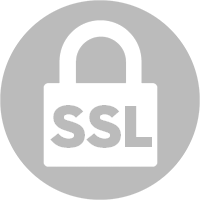 Be sure to browse the shop to find new favorites! We hope that this post finds you with the sun shining through your windows and that warm days are on your horizon! 2018 arrived a while ago, but the new beginnings are still sashaying in! On February 16th, the Chinese culture ushers in its New Year — and this year is the Year of the Dog. All across our blue and green globe, families who celebrate the Chinese New Year eat copious amounts of food, open lucky red envelopes, marvel at vibrant parades and paper lanterns, and sweep the bad luck right out of their homes. Each year is represented by 1 of 12 traditional animals, each with their own characteristic symbolism. The dog is known for its fierce loyalty and honesty — the makings of a truly good friend! With kindness and an inherently friendly nature, it’s a lovely thing to have a “dog” in your life. Additionally, it’s believed that having a child in Dog year is super-lucky, with the child enjoying a long life! So, we thought it’d be fun to kick of the Year of the Dog and share some peppy pooches from Masha’s collection. Full of warm wishes, dizzying bubbly, and decadent treats, a good birthday can send you soaring above the clouds. Might as well bring man’s best friend along! 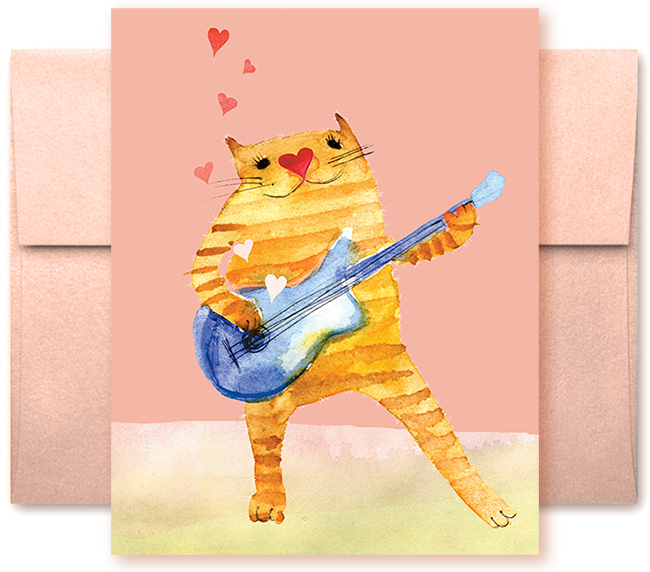 This card is an enchanting way to send a “birthday bow-wow!” to someone you love. 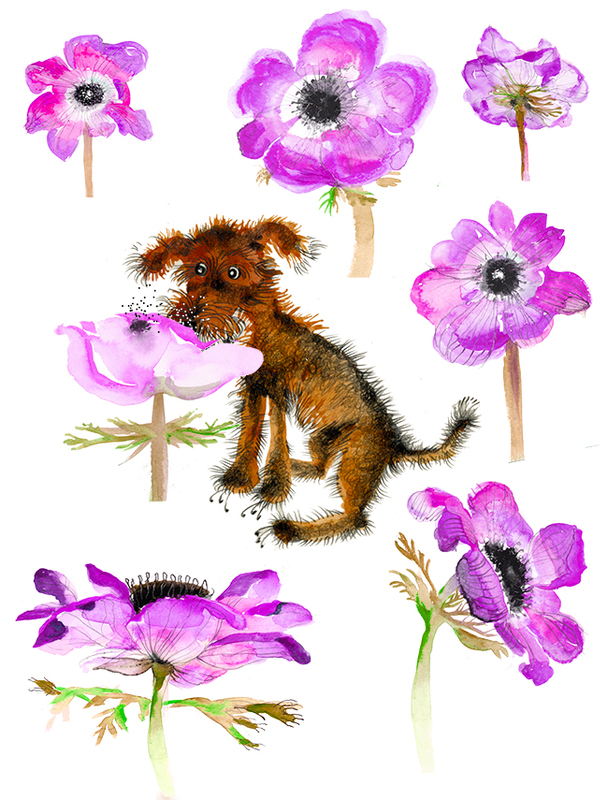 Let this pretty pup help you send a little love! 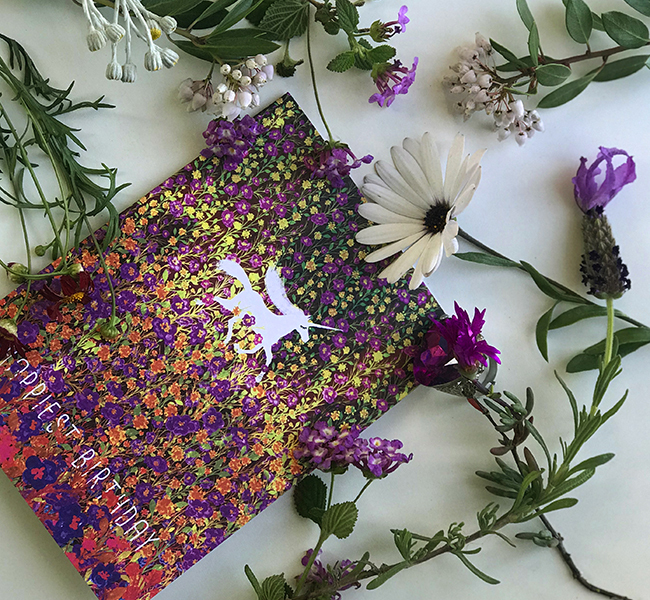 This charming card lets you know that love doesn’t have to be a fancy affair… sometimes a frolic through the flowers is all it takes! A snap in the air, icicles twinkling with a moment of sun, and just enough snow to build your own private winter palace… it’s the perfect time to have your best friend by your side. 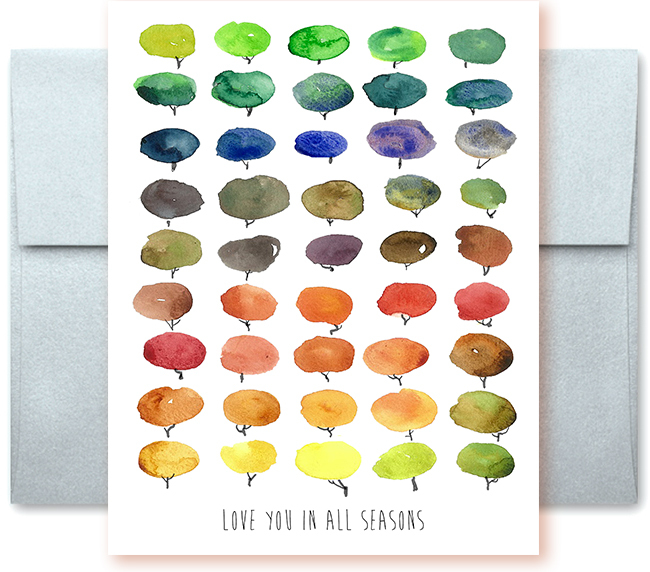 Let someone know you’d like to snuggle up and wonder at the world with this whimsical watercolor card. We wish you all a happy, friendly, Year of the Dog!